Dill is a sparse looking plant with feathery leaves and tiny yellow flowers. Stems are hollow and may require support unless grown close together. Plants will grow to a height of 2-3 feet, and will resist deer and attract butterflies. All parts of the plant are used for culinary purposes. 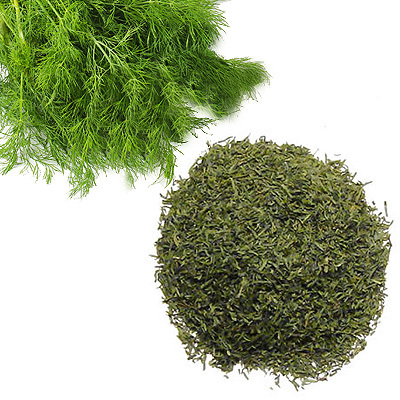 The taste of dill leaves resemble that of caraway, while the seeds are pungent and aromatic. Freshly cut, chopped leaves enhance the flavor of dips, herb butter, soups, fish dishes, and salads. The seeds are used in pickling and can also improve the taste of roasts, stews and vegetables. Try grinding the seeds to use as a salt substitute. Both the flowering heads and seeds are used in flavored vinegars and oils.